Registrations are open for the 5th Addiction Research Symposium on 14 March in Christchurch, organised by the University of Auckland, University of Otago and Victoria University of Wellington, with support from Matua Raki. This is an opportunity for New Zealand addiction researchers and research students to meet, share their work and discuss issues of common interest. 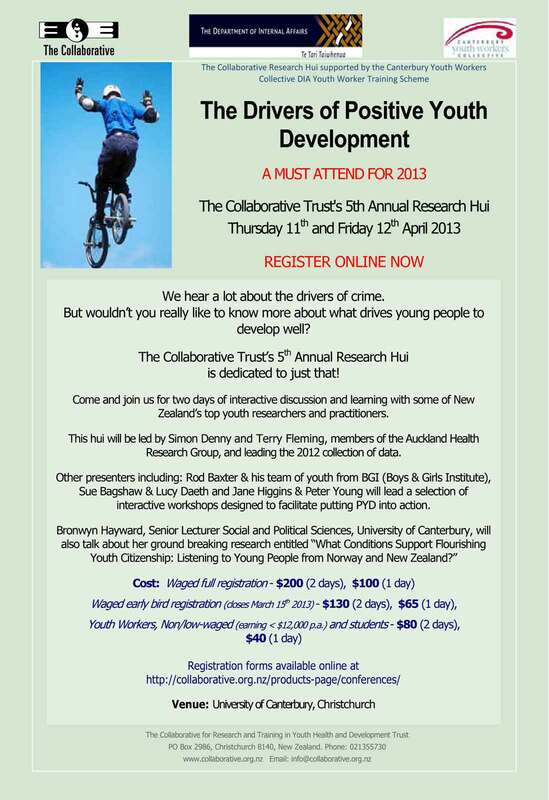 Contact Matua Raki project leader Klare Braye, or register your attendance below. NZQA Certificate in Peer Support (Mental Health Level 4) is being offered in Christcurch. Contact admin@mindandbody.co.nz for details of the course and available scholarships. Visit Mind and Body Learning and Development for more information. Nationwide consultation on the Crown’s review of the Community Development Act commences in September 2013, at a time when the New Zealand Māori Council is challenging Crown action on a number of issues vital to Māori rights and interests. These include rights to water, to the radio spectrum, to the benefits of the Crown Forestry Rental Trust, to citizenship and electoral rights and to provide safety to Māori communities through the Māori Wardens. The Council is concerned that the timing of the consultation process when these cases are pending and the exclusion of the Council as a partner in the consultation process puts at risk the Council’s work of advocating for and protecting Māori communities. Details about the Council’s current and past action to protect Māori rights and interests are attached to this letter. This letter encourages you either to attend the consultation hui www.tpk.govt.nz/en/consultation/mcda/ or to relay your views to the Council Secretary, Karen Waterreus (karen@maoricouncil.com). The unique feature of Council is its statutory mandate to work for and on behalf of the greater Māori community. Council works for all Māori, whoever we are and wherever we are. Council still has a job to do to protect Māori rights and interests and must remain in existence. Universal Periodic Review: Do New Zealanders Have Their Human Rights Upheld? The right to health, to justice, to work, to education, to be free from discrimination: these rights belong to all of us. New Zealand has signed international agreements to uphold these rights, but how well are we actually doing? The Universal Periodic Review is an important opportunity for individuals, NGOs and civil society organisations to share their experience and views on New Zealand’s realisation of human rights for everyone. What people and communities say can influence future developments. It isn’t just about writing reports. Communities will be consulted on what’s important for them. UPR 13/14 is an opportunity to work with other like minded groups, and to lobby the Government to make voluntary commitments and/or accept recommendations made by the working group following the UPR 13/14 process. The Commission is offering free workshops to support civil society in UPR 13/14. In addition there will be opportunities to engage in discussions with government officials in April/May and subsequently to comment on the draft New Zealand government report. The Commission would also welcome the opportunity to discuss key issues with community groups and individuals to feed into the UPR 13/14 process. You would like the Commission to assist with facilitating co-ordinated engagement from your sector. The Commission looks forward to working with you around UPR 13/14 to ensure the full and active engagement of civil society organisations across the country, helping to garner actual positive changes on the ground. Research shows up to half of Wellington teenagers have engaged in some sort of self injurious behaviour by the time they are 18 and GPs and guidance counsellors report a spike in such behaviour among teens in post quake Christchurch. For parents the revelation their child has deliberately self-harmed, often in the solitary secrecy of their bedroom at home using simple household objects is a profound shock. Radio New Zealand’s Sally Round talks to young people who have engaged in this form of self harm as well as those caring for them and in this interview asks whether enough is being done to build resilience among New Zealand’s youth. Missed it? No worries – Listen to the Interview Anytime on the SPINZ website! Are you enthusiastic with a passion to succeed and have a drive to support tamariki and taiohi and their whanau in a Kaupapa Maori environment? Purapura Whetu is seeking to fill a position in their Child and Youth Mental Health community team. Purapura Whetu is seeking to fill a new clinical position in their Youth Mental Health community team. You will work alongside other agencies in a collaborative model of care. Starting April 2013. Please email tari@pw.maori.nz for a copy of either job description. Applications must be received by Friday 15th March 2013. The Ministry of Health would like to hear your comments and ideas about the disability services they purchase. The Ministry of Health is committed to enabling people with disabilities to lead a good life. Disability Support Services staff will be travelling to towns around NZ to let you know what the Ministry plans to do over the next few years. Your questions, comments and ideas will help them to get it right. If you are a person with a disability, a family member or friend of a person with a disability we would welcome your attendance at these forums. You do not need to be a current user of Ministry-funded disability support services. Where will the forums be held? Four forums, one hui and one fono are being held in both the North and South Islands. The schedule below shows when they are coming to your area. Hui and fono will focus on improving disability services to Maori and Pasifika peoples. Sign Language Interpreters will be available at each meeting, other language interpreters will be arranged on request. It is hoped the forums, hui and fono will provide you with useful information and give you an opportunity to share ideas and give feedback.